Delighting our customers with our excellent performance, we have cemented our status as a top figure in the industry. As a Manufacturer, Exporter & Supplier, we proudly present Manual Perfume Bottle Collar Fitting Machine to our customers. We undergo a thorough process of vendor selection to procure raw materials only from the vendors who never fall short of delivering constant and excellent quality. It is known for its accurate design, durability and sturdiness. Collar fitting machine is a single head machine. This machine is very much in use for the perfume industry to press the top collar over the crimped portion to enhance the look of perfume bottle. So, this machine become an integral part of perfume business, since all quality perfumes now-a-days comes with steel/chrome plated collars on the bottle top. This machine is most suitable for small and medium business also. The machine is very easy to operate. There is no electricity required to operate this machine. AECF25 is made from Mild steel for main body and structure. The tool is made with special material which is soft but unbreakable, machined to get the correct size of collar, so that pressing is accurate each time. Machine is made very compact. This unit weighs only 12 Kgs. Area required is 1 foot X 1 foot. Table top mounting model with 4 holes given on the base plate. There is a bottle locating provision provided on base plate, which can be adjusted as per variations of bottle design and size. Height of pressing is also adjustable on the machine. By unlocking the head by given lever and adjusting the height on the vertical pillar is possible as per bottle height requirements. 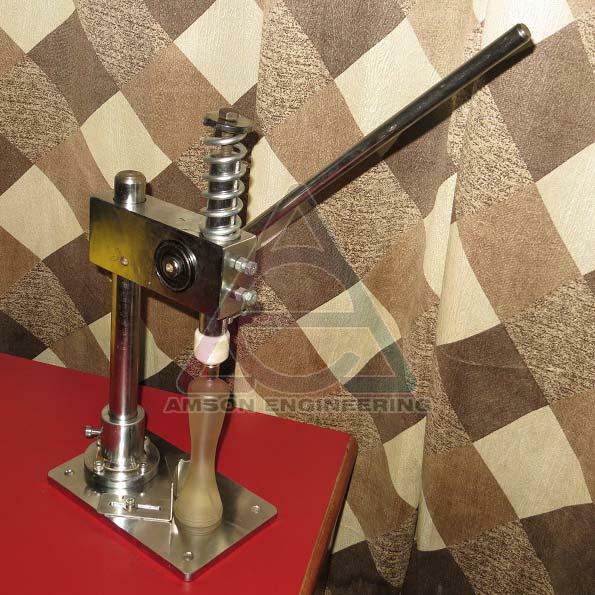 A hand operating lever is provided with the machine to function each pressing. When the filled and crimped bottle with top collar is placed below the press, the only operation done is to press the hand lever. Once pressed, a single collar is pressed with perfect tight. Special Features : Machine is small in size and can be carried by hands. The machine is attached with a standard sized tool, as per standard requirements. Can fit plated collars on Glass Bottles and other similar containers. Collar size - As per Pump size/ Collar size/ as per required. Output - Minimum 20 collars per minute/ depends upon labour skill. Pneumatic Collar Fitting Machine is also available on request. Automatic Filling and Crimping Machines are also manufactured by us as per customer specifications.